Our old world recipes use only top quality, wholesome ingredients. They are naturally cholesterol free and trans fat free. 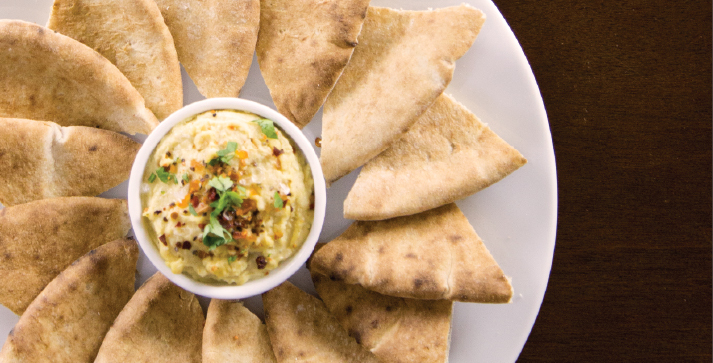 True to the original pita tradition, we hearth bake each bread to a perfect golden brown. Toufayan Pitettes® are convenient and versatile. This 1-ounce serving size is perfect filled or topped for breakfast, snacks or amazing appetizers. Just cut in half or at the top and fill with your favorite meats, salads or cheese. Just wondering why you have discontinued your classic white no salt added pittetes. These were amazing for someone like myself that is on a low sodium diet looking to keep a “white bread” in their diet. I haven’t seen these at ShopRite in months, so I’m assuming you don’t carry them anymore? We’re sorry, we no longer provide No Salt Pitettes. The low popularity means that most grocers just aren’t stocking them anymore. We don’t sell direct to consumers, so we rely on the markets and grocers who purchase our products to assess their customer’s interests. Please look for Low Carb – Low Sodium Wraps in your supermarket for an alternative low sodium product. If you’re store doesn’t carry our Low Sodium wraps, please ask your manager to add it to their inventory. I’m wondering if you’ve discontinued your onion Pitettes? I used to buy them at Kings grocery stores here in Northern NJ but none seem to carry them any more. Please advise. Thank you for your interest in our Sweet Onion Pitettes®! We have not discontinued this variety, though we’ve noticed its popularity here in the north east has decreased. Please ask your favorite grocer to add Toufayan Smart Pockets™ to their inventories or to contact us directly. In your area, Kings and Foodtown carry Toufayan Sweet Onion Pitettes®. It is up to each individual store manager to stock each variety of our products or not, but those grocers stock Sweet Onion Pitettes® in at least some of their stores. I thoroughly enjoy the taste and texture of your pita pocket breads. It is a very healthy alternative to pastries and the usual sandwich breads/rolls. I use the large pita’s for lunch and line the top and bottom halves with a butter bib lettuce so I can load up a sandwich or salad and the lettuce keeps the pita from getting soggy with any mayo or salad dressing. I recently discovered the mini pita pockets and I scramble and egg, fry ham and add cheese perhaps onions, garlic and can prepare it in 20 minutes (as I also make a pita sandwich) and I’m set for the day. Breakfast and lunch ready in 20-25 minutes. While I don’t do this every day I fix quick food 2-4 times a week. It’s healthy, quick and convenient. What I need help with is finding a store that stocks the mini pitas. I live in Rosedale, New York City and am having problems finding a store, please let me know here. PS – I package the larger pita sandwiches in the round stout Chinese Take Out containers so they don’t get crushed. It’s perfect for the beach and outdoor events. Hello Warren and thanks for your endorsement! Great idea with the soup containers, I’m totally going to use that one. If you send us a picture of your sandwich, we’ll post it in the recipe section! You can try Fairway (there is one in Douglastown). Foodtwon (in Hewlett or Hollis) or ShopRite. All of them carry our Pitettes®. Many franchises vary in their inventory from one store to another, however, since these grocers already order our products, its easy for your store manager to add our products to their store delivery. Please ask your favorite grocer to add Toufayan Hearth baked Pitettes® to their inventory. Let us know if you have any questions or comments. Like Lisa, I wished you would make some of your other products with no salt. I love the Pitettes Pita bread (whole wheat). Thank you for looking out for the consumers health. Can you please tell me storage conditions for hearth baked pitettes whole wheat. The product is really nice. I used it as mini pizza base. We recommend that you store our Hearth Baked Pittetes® in a cool dry place, room temperature is usually fine. Avoid storing bread on top of the refrigerator, because that area is usually warmer than the rest of your kitchen. Some people prefer to store bread in the fridge. That’s fine, just make sure that the bag is well-sealed. If you do keep it chilled, we recommend a short spin in the microwave before serving (on a microwave safe plate, cover the Pittetes® with a slightly damp paper towel and microwave on high for 20-30 seconds). If you freeze any breads, be sure that the bag is perfectly sealed with little or no air inside. It is best to freeze things that are already chilled, to ensure even temperature changes. Defrost overnight in the refrigerator and use within three days of defrosting. Breads can be kept frozen safely for up to 3 months. Oh my goodness! I’ve recently had to go on a low salt diet for high blood pressure. I just happened across your No Salt Pitettes. I need to say, “Thank you, thank you, thank you!” I love the taste, and they are the right size for my lunches. I wish you made regular type bread with no salt too. I’m going to check to see if you have any other no salt products! We currently offer Classic White and Whole Wheat Pitettes® as Salt Free options. You can also check our Low Sodium options for other varieties. We need a distributor in Wisconsin. Please let us know where to buy your products for our restaurant. Thanks. Thanks for your interest! You can contact a representative via our contact form or email us directly. Also, Country Market, Econo Foods, Family Fresh, Market Place, Meijer and Woodman’s all carry our products in Wisconsin. You can check specific availability with our store finder. Continental and mouth watering, these delicious sliders are sure to be the talk of the party! Remember to put one aside before you set them out, or you won't get one for yourself!